The right ergonomic office chair will improve your health and productivity. Working in an office often involves sitting in an office chair for many hours, which can put a great deal of stress on your spine. That’s why it’s important to have an office chair that supports good ergonomics and promotes healthy posture. Ergonomic office chairs can offer a lot of benefits, but how do you know which one is right fit for you? Mark Downs is here to help you find out. There are a number of things every ergonomic office chair should have. A chair with adjustable seat height, often with a pneumatic adjustable lever, is essential. You should typically keep your flat with the floor and your thighs and arms even with the height of the desk. Everybody is different, so having a chair that’s adjustable will help you find the right chair height for you. When looking for a good ergonomic chair you should make sure the seat has enough width and depth to comfortably support you. The depth should also be enough that you can sit with your back against the backrest while leaving approximately 2 to 4 inches between the back of your knees and the seat of your chair. Make sure your chair can also adjust the forward and backward tilt of the seat. One of the most critical components of any ergonomic office chair is the lower back support. Sitting for long periods of time without support for the curve on your lumbar spine leads to slouching and strain on your lower spine. An ergonomic chair with a lumbar adjustment can provide proper support for your lower back. A good ergonomic office chair has a backrest that provides proper support for the curvature of your spine. If your ergonomic chair’s backrest is separate from the seat you should make sure it is height and angle adjustable. If the backrest and seat are one piece you should make sure it’s forward and backward adjustable, and also has a locking mechanism to secure it in place. An ergonomic office chair should provide plenty of padding. A breathable cloth fabric will make sitting for long periods of time more comfortable than with hard surfaces. 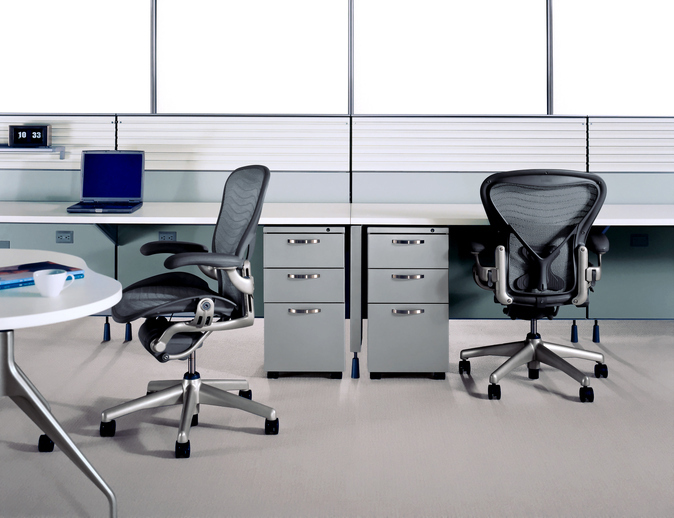 Adjustable armrests and swivel mechanics are also nice features to have on an ergonomic office chair. The armrest should provide ample room for your elbows and lower arms to rest while your shoulders maintain a relaxed position. Rotatable swivel features will make maneuvering your office easier and more comfortable. Remember, you may spend thousands of hours sitting down in your office. Investing in a high quality ergonomic office chair is a good way to boost productive and ensure a healthy, comfortable lifestyle. Looking for an ergonomic office chair? Come into Mark Downs today. Mark Downs is happy to help you get the most productive, creative, and positive work environment through our office furniture and design expertise. Stop by our Cockeysville showroom to see what we can offer or give us a call at 410-771-6800. To see examples of our work and what we are up to, follow us on Facebook, Twitter, LinkedIn, and Pinterest. This entry was posted on Thursday, June 16th, 2016 at 7:40 pm. Both comments and pings are currently closed.